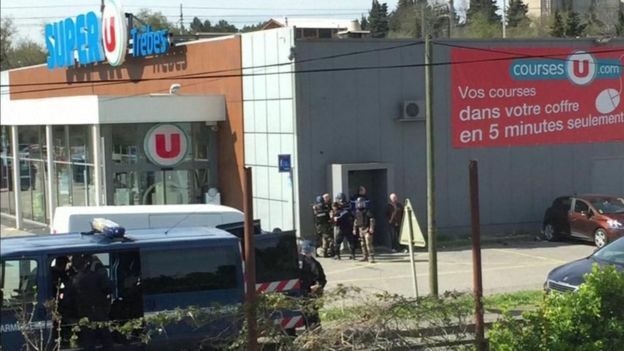 A gunman has killed at least two people during a hostage-taking at a supermarket in Trèbes, southern France, authorities say. An operation involving elite police is continuing at the Super U shop, where others were wounded. Reports say the gunman, who remains in the supermarket, pledged allegiance to the Islamic State group. Earlier, a policeman was shot and wounded while jogging with colleagues in Carcassonne, a 15-minute drive away. He was shot in the shoulder by the same suspect involved in the supermarket hostage-taking but is not critically injured, Yves Lefebvre, secretary-general of the SGP Police-FO union told the Associated Press. Trèbes Mayor Eric Menassi told BFM TV that the gunman was now alone in the shop with one police officer, after other hostages were freed. The suspect is said to be heavily armed and asking for the release of Salah Abdeslam, the most important surviving suspect in the 13 November 2015 Paris attacks, which killed 130 people. Reports say the suspect is known to French intelligence services.